To Robert and Elizabeth Scott was born John in 1812. 1850 census of Greenbrier County, John was 38 years old, a laborer. Easter was 39 years old. 1860 census of Jackson County, [W] VA., he was a farmer living in the Tug Fork area. 1870 census of Sullivan County, Missouri, still a farming. Value of their real estate listed as $4,300.00. Their personal estate value was $2,300.00. Probate after his death was in 1871. John Scott is buried in Sullivan County--Hurst Cemetery, located in Section 5, Township 64 North, Range 20 West in Jackson township about 8.5 miles North and West of Milan. Easter traveled west with her children to Washington Territory by wagon in approximately 1882. There are so many things handed down in families, the stories, the pictures, physical features, behaviors...so many tangible and intangible inherited gifts. My big discovery with genealogy is that there are many things that come down to us and we are not even aware of them. I remember that Dad liked to make Irish stew with the clear broth and Mom liked to make Bohemian Stew with tomato base. Dad's family was Scotch-Irish and Mom's family was Bohemian. My Dad liked to do a little dance when he was happy and sometimes when he was teasing us; it was a flat-foot step that looked something like a tap dance but wasn't. Dow, my brother, said that Dad told him our grandfather liked to dance. Once when Dow was on a bicycle trip in West Virginia along the Greenbrier River he stopped in a little town where a festival was taking place and he watched the people dance. It hit him that the dancing that he was watching was what he saw our Dad dance--a form of an ancient Scottish dance that had been passed down through our family.. Uncle Wallace said that our Scotts owned land in Virginia on a mountain that overlooked a beautiful green river. Just this year I have found that John Scott bought land at the foot of Droop Mountain that over looked the waters of the beautiful Greenbrier River. While researching records about John and Easter Scott, I was fortunate to make connections with one of his great-granddaughters who lived in Missouri. Maxine was raised by her Grandmother, Ann Eliza (Scott) Sears after her own mother died. While my family has lost most of the WV stories, this great-granddaughter of John Scott told me stories that she heard from her Grandmother. Maxine said that Ann Eliza who left WV during the Civil War always missed her beautiful Virginia. I will relate some of the stories about John Scott. Ann Eliza told Maxine that the Scott family lived in a log house on the side of a mountain which overlooked a beautiful river. Every night John Scott would bring a back log--a log to burn all night so that they would not have to restart the fire in the morning--into the house. She said that her father would stand this log-- which was taller than his 6 feet height--on end and walk it into the house by tipping it side to side and rotating it forward.. He would place this back log in the fireplace that took up one full wall of the house. Ann Eliza also said that all the children of John Scott were great swimmers because they would swim in the river almost every day in the summer. Maxine reported that Ann Eliza always talked fondly about her beautiful [W] Virginia and how she regretted that her family had to leave there. The first record that I found for my great-grandfather and great-grandmother was their marriage record in Greenbrier County. It provided scanty information. I, Eugene V. Spence, Clerk of the County Commission in ad for said County and State (the same being a Court of Record), also the Custodian of the Marriage Records, do hereby certify that the Marriage Record discloses the following facts that John Scott and Esther Erwin were united in marriage by William G. Campbell , on the 30th day of January 1833. In April of 1846 Benjamin Erwin sold to John Scott for $1.00 100 acres of land adjoining Samuel Beard. Later in 1848, Benjamin Erwin willed another 100 acres to his son-in-law, John Scott. The 1850 Federal Census of Greenbrier County lists John age 38 and Esther age 39 and children, Elizabeth age 14, Robert William age13, Charles age 11, Louisa age 9, Nancy J age 7, James A. age 3 and Ann E. age 1. John's occupation was laborer. By 1860 John Scott and family were located in Jackson County, [W] Virginia. According to Robert William Scott's obituary, the family moved to Jackson County in 1859. 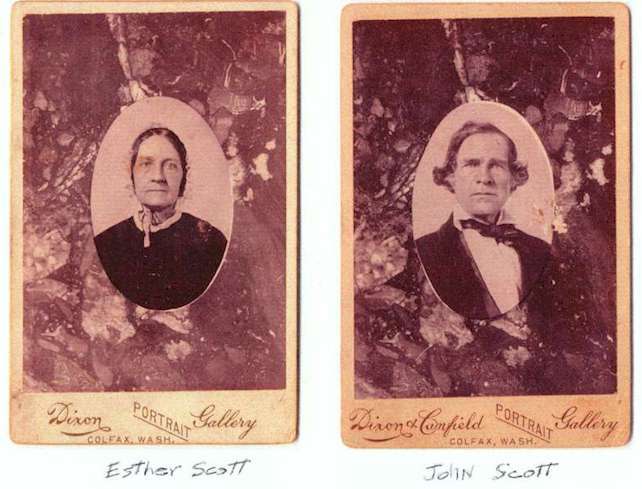 The John Scotts are found on the 1860 Federal Census in Jackson County, WV on the Tug Fork. In 1860 Robert William married Sarah E. Bonnett, widow of Nicholas Bonnett and in 1861 Charles B. Scott married Sarah Ann Bonnett, the step-daughter of Sarah E.
The Civil War years that followed were hard for the Scotts as they were hard on everyone. Robert W. and Charles B. both joined the WV Home Guard. Maxine told a good story about this time. John Asbury, born in 1854 and the youngest child of John Scott was put in charge of the domestic animals and he named their two mean roosters that fought with each other, Lincoln and Jefferson. One morning John Asbury came in and told everyone that the soldiers had stolen Jefferson and "they were going to have some tough eating tonight.." Ann Eliza told Maxine that it seemed like the war was being fought on their front yard. John Scott lost everything that he owned--livestock, farming tools, crops--except his land.. There seemed to be only two options left to him, go to work as a laborer in the mines or leave [West] Virginia. He said that he would rather die than work in the mines so in 1862, John moved his family to Missouri. The family took a flat boat up the Ohio River. A story that Ann Eliza told about this move was the family traveled to the location where they were to meet the flat boat that was to take them up the river but they missed the one they wanted to catch and had to wait for the next one. Later they learned that Confederate soldiers fired on the boat that they had missed and it was sunk. Possessions were lost and people drowned. The Scotts felt bad about the flat boat that was lost but thanked God for his mercy to them. The children who moved to Missouri with their parents were Margaret Louisa (Lou), Nancy Jane, James Alexander Meade, Ann Eliza and Caroline H. Charles B. Scott and his family followed the others to Missouri after the war about 1864. Robert William and family stayed in West Virginia. Maxine remembers that her grandmother told her that the youngest son, John Asbury stayed in West Virginia, possibly with his older brothers and didn't join the rest of his family in Missouri until after the war. There is no record of when oldest daughter, Elizabeth and husband Arthur McClure moved but they were listed in the Jackson County 1860 Census just below her parent's family, later Elizabeth and Arthur were found in the 1870 Putman County, MO federal census. To the Hon C M Kincaid Judge of the probate Court of said County and Territory. Your petitioner JAM Scott would respectfully represent that Esther Scott died on or about the 15th day of March AD 1885 in the said county of Whitman County, Wash Terr. That said deceased was a resident of said county and Territory at the time of her death. That said deceased left estate in said County and Ter consisting entirely of personal personnel property. That said value and character of said property so far as is known to your applicant consists of the following towit. 1 cow and two promissory notes drawn in favor of said deceased. One for about one hundred dollars drawn in favor of deceased by Wm Ritchie. One for two dollars drawn in favor of deceased by CB Scott. That the Estate and Effects for and in respect of which letters of administration on hereby applied for do not exceed the value of four hundred dollars. That the next of kind of said deceased is and heirs at Raw is CB Scott Lone Pine Wash Terr; RW Scott Ripley Jackson Co, WV; JA Scott Prescott Arizona; Margaret L. Cheuvront Farmington, WT; Nancy J. Scott Lone Pine WT; Anne E. Sears Milan MO; Elizabeth McClure Farmington WT (Elizabeth died in 1878, her sons probably lived in Farmington. ); JAM Scott Farmington WT. That due search and inquiry has been made to as certain if said deceased left any will and Testament but non has been found and according to the best of knowledge and belief of your petitioner said deceased died intestate. In May of 2000, I followed my Cousin Bruce Scott Junior down dusty gravel roads in Whitman County to an overgrown corner of a wheat field where he had chopped out a lilac bush to find Easter Scott's grave and headstone. I wondered how many long years it had been since a family member had visited Easter's grave and left flowers.